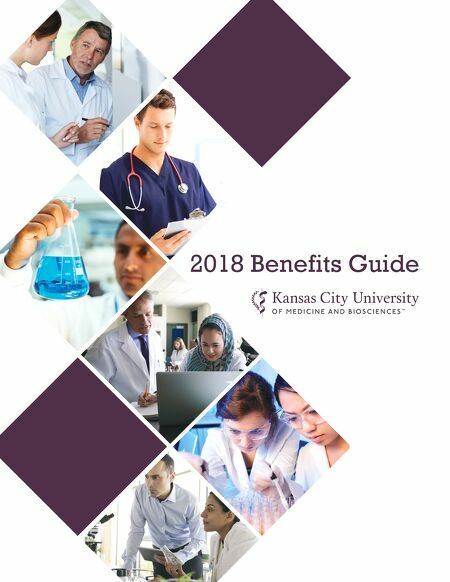 2018 Benefits Guide BRANDMARKS Kansas City University O F M E D I C I N E A N D B I O S C I E N C E S ™ Kansas City University O F M E D I C I N E A N D B I O S C I E N C E S ™ Kansas City University O F M E D I C I N E A N D B I O S C I E N C E S ™ BLACK AND WHITE e black and white logo is to be used very sparingly and used for special applications or processes that require a monotone logo. REVERSED THREE-COLOR e reversed-out version provides extra contrast and allows for flexibility. Note: e rectangle ed an example of background color and not part of the dign. FOUR-COLOR e primary logo should be used in most applications. is full-color logo should always be the most prominent mark used.